This book presents Down syndrome, which is the most common chromosomal disorder in humans, occurring at a rate of about 1 in 700 births. It describes the characteristic physical features caused by Down syndrome and the myriad of symptoms and health complications it brings, including heart defects, congenital vision and hearing loss, abnormalities of the musculoskeletal system, digestive problems, epilepsy, leukemia, an increased risk of infectious disease, dementia, and intellectual disability. Readers will learn about methods by which Down syndrome can be diagnosed prenatally or at birth, and the cause of Down syndrome as extra copies of the approximately 250 genes on chromosome 21. 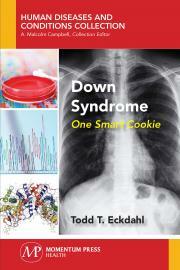 The book describes treatments and therapies for Down syndrome, and approaches to the education of children with it. Future prospects for the diagnosis and treatment of Down syndrome are presented, including experimental drugs, stem cell therapies, a process by which embryos produced in a clinical laboratory can be screened for Down syndrome before being used to establish a pregnancy, and several Down syndrome gene therapy strategies. Dr. Todd T. Eckdahl earned a BS in chemistry from the University Minnesota, Duluth, and a PhD in molecular genetics from Purdue University. He is currently professor of biology at Missouri Western State University, where he teaches genetics and conducts research in collaboration with undergraduate students that is supported by the National Science Foundation. Dr. Eckdahl has published over 40 articles in professional journals that contribute to molecular genetics and synthetic biology research and to undergraduate science education.